Once again an individual with a Gustavus connection has been nominated for a GRAMMY™ Award. When the nominations for the 57th annual GRAMMY™ Awards were announced on Dec. 5, James Patrick Miller, the Douglas Nimmo Professor of the Gustavus Wind Orchestra was among those nominated in the “Contemporary Classical Composition” category. Dr. Miller was nominated along with Eric Berlin, Richard Kelley and the UMASS Wind Ensemble for their recording of Stephen Paulus’ Concerto For Two Trumpets & Band. 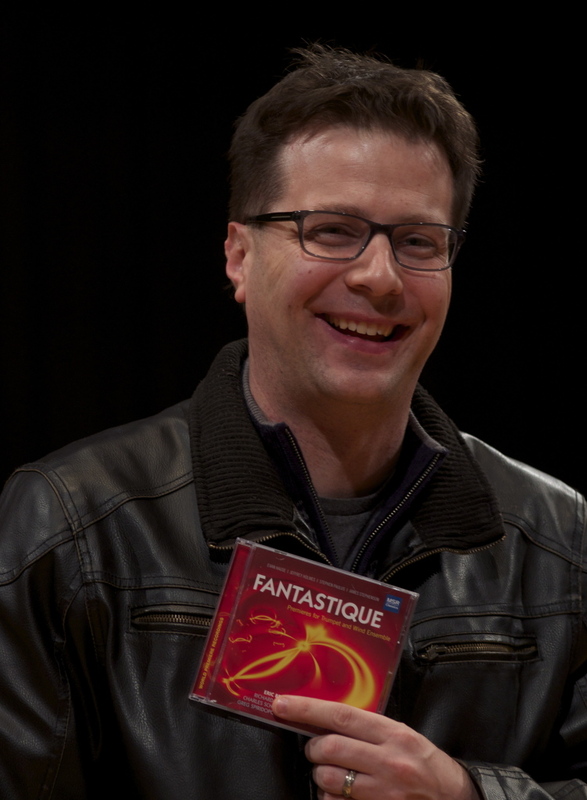 The number was recorded as part of the album Fantastique: Premieres for Trumpet and Wind Ensemble, which was released September 1, 2014. The album is available for purchase on the MSR Classics label. “This nomination is all about our dearly missed friend and colleague, Stephen Paulus. His magnificent Concerto for Two Trumpets and Band exemplifies a compositional voice that was austerely beautiful, deeply passionate, and one of the most heartfelt and honest styles that I have ever heard. To have worked with him on this project and to have played a small part in bringing his concerto to international acclaim is an honor that humbles me to my core,” Miller said. If the Concerto were to win in the category of Best Contemporary Classical Composition the composer, Stephen Paulus, or in this case his family, would take home the GRAMMY Award. Dr. Miller first joined the Gustavus music faculty in 2008 as interim conductor of the Gustavus and Vasa Wind Orchestras, while also teaching courses in conducting and music education. From 2009 to 2014, Miller was Assistant Professor and Director of Wind Studies at the University of Massachusetts in Amherst, where he led the wind ensemble, symphony band, summer conducting institute, and taught graduate and undergraduate conducting. Miller returned to Gustavus in the fall of 2014 following the retirement of Dr. Douglas Nimmo, the longtime conductor of the Gustavus Wind Orchestra. Originally from Winona, Minn., Dr. Miller holds a doctor of musical arts degree in conducting from the University of Minnesota where he was named a College of Liberal Arts and School of Music Graduate Research Fellow. He also holds a master of music degree in conducting from Ithaca College and a bachelor’s degree in music education from St. Olaf College. As noted earlier, Miller is not the first individual with a Gustavus connection to be nominated for a GRAMMY™ Award. Jazz vocalist Kurt Elling, a member of the Gustavus class of 1989, is a GRAMMY™ Award winner who has had all 10 of his albums nominated for a GRAMMY™ Award in some fashion. This year’s GRAMMY™ Awards will be presented at Staples Center in Los Angeles on Feb. 8.